WordPress - what is it? And which should I use? And which version should I use? WordPress came about when two developers (Matt Mullenweg and Mike Little) who worked on the b2 cafelog, 2001 project decided they wanted to create a ‘fork’ of b2. And in 2003 (27th May) WordPress was released. Originally WordPress was created as an improved alternative to b2. Allowing better display, and more customisation of the content and how it was displayed. The code for WordPress is open-source, with hundreds of developers from all corners of the globe working on it. Being open source also means you can use it for anything, from your own personal travel blog, or a major CMS (content management system) for a worldwide organisation. There are two versions of WordPress – the Commercial version (WordPress.com) and the open source ‘organisation’ version (WordPress.org). The Commercial version runs all the sites from the (wordpress.com) central host. It’s a good system for anyone setting up a site without a budget for a professional site, this is more suited to a personal hobby site or blog. While the initial site is free, there may however still be some costs encountered with the commercial version. For a start, if you want your domain name to be www.yourcompany.com, instead of the free www.yourcompany.wordpress.com, then that will cost approximately $18 per year. If you want to remove adverts, that’ll be another $30 per year. Also premium themes start at $50. This often means that what started as a free option, can soon mount up to be quite expensive. The open-source version is aimed at those that want the ability to take control of their site, allowing them (or a designer/developer) to install any of the thousands of plugins and themes readily available (both free and paid). If you have you’re WordPress site hosted anywhere that is not on the wordpress.com servers, then WordPress.org should be bookmarked and visited regularly, checking for updates etc. With the self-hosted version, you can even contract developers to create completely custom plugins for your site. Similarly, you can also contract designers (such as MacGraphic) to create a custom theme for your site, making it truly unlimited as far as expandability goes. The site WordPress.org is a central source for the core files, as well as the many themes and plugins. Most of the plugins and themes available from the WordPress directories can be downloaded free of charge. It also has a great codex and support system in place for those ‘how do I do this’ questions. Keep in mind, however, that each and every theme on there will most likely be in use on several hundred (if not thousands) of other sites, so it’s not the best option for creating a unique appearance for your business site. Themes can also be created and customised by professional designers such as MacGraphic to suit the business or group it is marketing. While this sounds like it may be an expensive option, it does not have to be. At MacGraphic we offer alternative options for theme creation. We can take an existing (free) theme, and modify it, to best match your companies existing branding. We can also offer the same for premium themes. 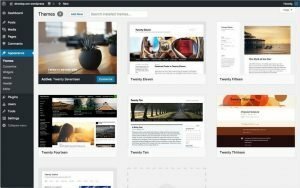 Premium themes often offer more functionality as well as better coded design. With the self-hosted, organisation version of the system, you will have to source hosting for your site. Many hosting companies, including MacGraphic offer WP (WordPress) as a free one-click-install within the hosting control panel. This means you do not have to download and install WordPress on your hosting, it can all be done easily and quickly from within your hosting control panel. If you’re a developer or designer and know your way around PHP and CSS, the WP core files are freely available. These can be downloaded and installed on your server or local machine (extra set-up required). From those files, you can customise everything from simple colour alterations, to how a group of posts are displayed on a given page. However, it is not a good idea to change the WordPress core files, unless it is absolutely needed for your site. Any future updates will remove any customizations previously created. A better method is to have a designer create a theme tailored to your sites specific needs. This not only gives your businesses web presence a uniquely tailored appearance, it also means the code can also be created to the sites specific needs, for example, shopping carts. Using a custom designed theme also means updates will not overwrite the files. Providing it is set-up correctly. Some functionality may require adding either a free or premium plugin. Or if required you can even employ a developer to create a plugin, specially designed to suit your needs. WordPress is used by over 14.7% of Alexa Internet’s “top 1 million” websites, and back in August 2011 at least 22% of all new websites were WordPress sites. As of April 2013, version 3.5 (the latest version) has been downloaded over 18 million times. The text ‘b2 cafelog‘ originally linked to http://cafelog.com . Thanks to Bryan Innes – Content Specialist (WhoIsHostingThis.com) for the heads-up.